The story on CNBC News last night had a title like something you'd read in an 'end times prophecy' story except that it was all very real and based within the financial world: "Nasdaq 'Death Cross' Forms 'Four Horsemen' Pattern". In it we learn exactly why this financial story has such an apocalyptic name; Nasdaq has just become the 4th of the major indexes to go into a death cross formation and for the 1st time since 2011, "all four horseman of the apocalypse" are in a 'death cross' simultaneously. In the 1st video below, ExplorerOne breaks down some possibly cryptic recent Barack Obama tweets while telling us more about this Nasdaq 'death cross' that signals the 'fourth horseman' of the apocalypse CNBC told us of while in the 2nd video below, Dr. Jim Willie joins Paul Sandhu to talk with us about everything else in the financial world that the mainstream media refuses to tell us including taking a look at the slowly dying dollar that has long ago seen its' best days. 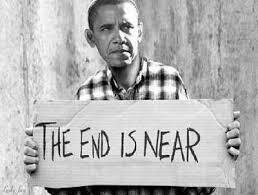 With businessman Carl Ichan now warning that there is danger and a looming catastrophe ahead, we wonder if this is what Obama was referring to in a recent tweet "Hope You're Ready" that came out just days ago as discussed in the 1st video. We also learned today from Zero Hedge that UBS is about to blow the cover on a massive gold-rigging scandal and with central banks and the FED traditionally being the biggest gold manipulators on the planet, this is another sign that everything is about to fall apart as the markets suffer another 'black monday' and Deutsche Bank is prepared to become this cycle's Lehman Brothers according to the Dollar Vigilante. So, was there a cryptic reason behind Barack Obama's recent tweets, especially the one in which he urged "I hope you're ready"? Jim Willie's recent video with Paul Sandhu in 2nd video below.